Following my credo of looking for work when you have plenty on your plate I landed this job yesterday. The church converted it’s confessionals from having three doors to two. The priest had used the center door and the flanking two were for the people to enter. The center door is now not needed as only the two outer doors are used and a divider installed where the center door used to be. The priest gave me this small prayer card as the inspiration of what he had in mind to disguise the door. 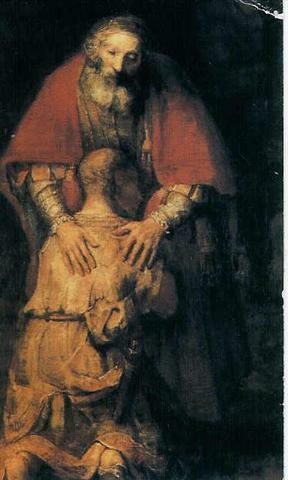 I suggested a shallow relief carving depicting this scene of the Prodigal son asking for forgiveness,,but with a twist. I don’t know how I got this idea ,,and it might sound crazy but I plan to not only carve it as a relief,,but to pierce it as you would a pumpkin. By cutting out the door and building a shallow light box covering it with frosted glass or plexi then overlaying it with the carving I could create an interesting image that would show up in the usual soft lighting in the church. Or when the lighting is on full,,you see the carving itself. I’ve never done anything like this and I’m not sure how it will work out but I’ve thought of several ways to check out what the results would be and how to plan the carving and cutouts to blend seamlessly…..I hope. Then,,never one to leave money on the table,,I made a comment on how I thought the panels behind the presiding chair looked a bit dated and did nothing for the Sanctuary. “What do you suggest” was all I needed to hear. Well,,,the center one would look good with swags of roses ( the church is St.Theresa and this is her symbol,,roses) overlaying linenfold type panel with possibly a Eucharistic symbol in the center,, with matching panels on both sides. They are currently done in a dark burgundy velvet type material with grape leaf/vine designs in silver and gold thread,,with embroidered rose designs around the edges. It’s not as bad as it sounds,,but a bit dated and tacky. The center panel is approx. 5 ft wide X 8-9 ft tall,,and the side panels are maybe 4 ft.x 7. Well he was just thrilled and got him thinking. How about the water damage from the AC on this fresco..do you know anyone who could repair it? Well,,,sure I know just the guy! And then he asked what I thought of the panels covering the radiators which wrap around the entire church,,,and do you think you could do anything with this statue over here,,,,and would you have any ideas for a new Ambry?? ?,,,,You know me already,,,he shouldn’t have asked.